It is incredibly easy to mark and measure bumblebees without having to kill them. I have marked and measured hundreds and have never been stung and have never killed a bee while marking it. Bumblebees are very tolerant and co-operative animals to work with. 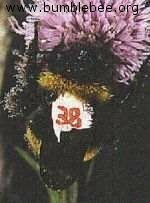 I used this method while doing my field work for my thesis at Aberdeen University, it requires no expensive or specialised equipment and will allow you to recognise individual bees for at least 15 days after marking. As different species of bumblebee vary in size and strength a device is necessary that can restrain any bumblebee, big or small. This can be made from the top 3.5 cm of a 6.5 cm wide plastic flower pot and piece of plastic net (the kind used to hold tangerines is fine) with a 4-5mm mesh. See below. Secure the net over the top of the pot with a length of tape. This mesh size is small enough to prevent escape of even small bees and large enough to allow the bee to be marked between the threads. The plastic top of an aerosol cap can be used to form a plunger that can be moved up inside the flower pot, to trap the bee between the mesh and the top of the aerosol cap. 1 mm graph paper can be sellotaped to the aerosol cap if you want to make body measurements such as head width/length. The conical shape of the restraining device makes it possible to fit it over almost any size of glass jar, so you can either gather a number of bees in jars to mark one after the other, or you can use the restraining device to catch and mark bees on the spot. Once the bee is on the net the aerosol cap is placed under the opening to prevent escape. It is possible to hold the aerosol cap in place with one hand, while offering the bee 30:70 honey and water in a plastic pipette with the other. The end of the plastic pipette can be marked in 1 mm intervals with a pen, though before you mark the pipette you should practice offering nectar to some big bees to make sure the end of the pipette is wide enough. With a little practice it is possible to move the meniscus of the nectar up and down the pipette so forcing the bee to extend its tongue to maximum foraging length, which can be seen through the plastic and its length measured. After the tongue length is measured the aerosol top is moved up the inside of the pot until it touches the back of the bee. Usually this will make the bee turn round and walk on the aerosol top. Next flower pot was moved down with just enough pressure to stop the bee moving its thorax. Its head length and width and other body measurements can now be made, and then the bee can be marked through the threads in the net. Water based Tipp-Ex in four colours, white, blue, green and pink, can be used to paint a disc on the bee, carefully avoiding the tegulae (wing bases). A small blob of Tipp-ex is placed on the thorax using the brush provided, the blob is then smoothed down with a blunted cocktail stick, this also flattened the hairs on the thorax. Since Bombus pascuorum has a very hairy thorax, the layer of Tipp-Ex might be insufficient to flatten the hairs, so before marking this species the hairs can be either trimmed using a very small pair of scissors, or scraped off carefully using a scalpel. Once the Tipp-Ex has dried, a number from 1 to 100 can be written on the Tipp-Ex with a pen, and the bee set free. It is possible to use different coloured pens, but I have found that after prolonged sunshine the writing fades a little, and it might not be possible to tell the difference in colours of a foraging bee. However it is quite easy to make out the different coloured Tipp-ex even if part of it is dirty.